An alleged member of a transnational drug smuggling organization was arrested for drug trafficking in Capitol Hill in mid-March, and more than 315 pounds of methamphetamine was reportedly later recovered between a Leschi home he had been renting and vehicle he was driving. Homeland Security Investigations has been investigating this drug smuggling organization’s transporting large amounts of drugs from the United States to Canada since April 2017, according to a criminal complaint filed by the U.S. Attorney’s Office in U.S. District Court on March 14. An undercover HSI agent had communicated to the organization that they could assist in transporting drugs from San Diego to Seattle. Representatives from the organization met with undercover agents in San Diego in February. The undercover agents showed the smugglers 100 kilogram-sized packages of cocaine — previously seized by the U.S. Coast Guard during a June 2016 smuggling case, according to the complaint. The organization reportedly tested 50 packages, and then purchased 18 for transport to an organization member in Seattle, according to the criminal complaint. In order to ensure the right person was identified when they made the handoff, the complaint states an undercover agent ripped a dollar bill in half, and the contact in Seattle would later need to verify the correct serial number. 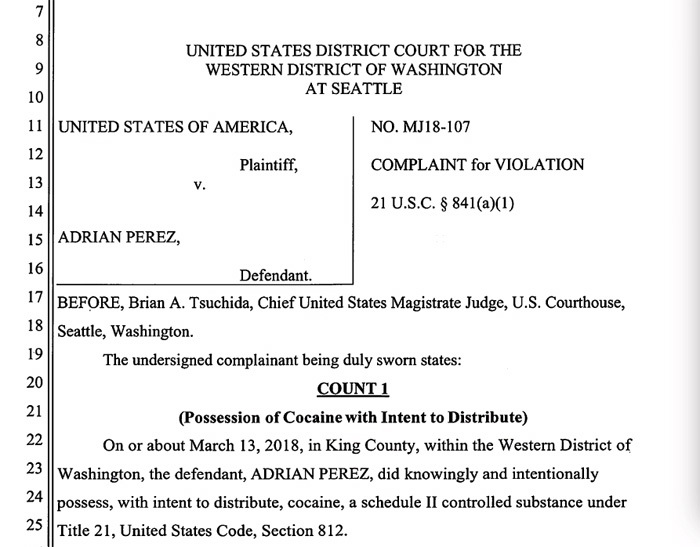 A controlled delivery was set up for March 13, and an undercover agent with the duffel bag filled with 18 packages of cocaine met 41-year-old Adrian Perez at a parking lot in the 1500 block of 15th Avenue in Capitol Hill, according to the complaint. Perez reportedly checked the packages of cocaine in the parking lot, and then put them in the back of the GMC Sierra he had arrived in. At that point law enforcement came in and took Perez into custody, according to the complaint. The Seattle Police Department reports it assisted with the investigation and drug bust, which resulted in officers serving a search warrant at a HomeAway rental property in Leschi that Perez had been staying in four days prior to his arrest —HomeAway is a short-term rental platform similar to Airbnb. SPD reports officers found 150 pounds of methamphetamine in the home and $4,000 in cash. HSI allegedly found another 165 pounds of meth in Perez’s vehicle, according to SPD. SPD reports Perez is facing a mandatory minimum 10 years in prison if convicted, due to the large quantities of drugs allegedly found in his possession.